Recently I was privileged to attend the Denver Mining Investment Forum 2001. Two remarkable presentations delivered there brilliantly illuminated the fissures and contradictions within the gold community. The first concerned the Gold Marketing Initiative (the "GMI"), a call for concerted industry action to increase the demand for gold as jewelry, made by a group calling itself the "Steering Committee." The second, made by Chris Thompson of Gold Fields Limited, was a thoughtful industry analysis that dealt with the GMI by incorporating it into a broader and smarter dialogue on the crisis facing the industry. A third presentation was conspicuous by its absence: a discussion of the implications for all gold producers if the entire gold market is rigged, as alleged in a pending federal lawsuit. and increasing by $10.00 per ounce per annum, through to 6 July 2007." The Steering Committee retained McKinsey & Company to conduct an "independent review of whether investment in a large-scale marketing initiative for gold jewellery would be effective in increasing demand for gold, and ultimately of significant economic benefit of the gold industry." McKinsey duly concluded that it would, and was there in Denver to tell us all about it. Their findings are summarized in a classic consulting pitchbook, very pretty, larded with graphics and matrices, hold the analytics. Page two of the pitchbook gets right to the heart of it. The GMI will deliver three good things: (1) 340-500 additional tonnes of gold jewelry demand by 2006, over an undisclosed baseline; (2) a $30-$40/oz. increase in the spot price, also over an undisclosed baseline, "depending on the scenario;" and (3) "Net Present Value of $9 billion-$12 billion for the producers, spread equally across every ounce of production." There's a catch, however. Several, actually. Page 18 of the brochure notes that the new demand and the concomitant higher price will likely prompt yet more hedging, to the tune of an estimated maximum of 200-300 tonnes of accelerated supply. Despite the presence in the Steering Committee of the world's leading authorities on hedging, the only sources cited for this assumption are: "analyst interviews;" Virtual Metals Research & Consulting (you remember Jessica Cross of Gold Derivatives: The market view); and McKinsey Analysis. (I watched and waited but not one of the assembled members of the Steering Committee rushed forward to take the pledge to cut back. So I'm more comfortable with the higher than the lower end of this range, assuming it bears any relation whatever to reality.) Worse, additional sales by central banks will hit the market as soon as the price moves up, to the tune of an estimated 200 tonnes per annum, but "only as long as market sentiment remains bullish." Echoes of Chairman Greenspan. So to figure out what the GMI really proposes to deliver we need to do some arithmetic. Over the six year projection period, the gross cumulative tonnage increase in gold jewelry demand is estimated in a nice tight range of 970 to 1,430 tonnes. But if we net out the accelerated supply from new hedging and central bank sales during that same period, or 900 tonnes, we are left with only 70 to 530 tonnes as the program's projected cumulative, net increase in demand. The GMI's benefits do not come cheap. The cost ramps up from $10-$15 million paid out for spadework in 2001 to $160-$210 million in years 2004 through 2006, when the campaign hits its stride. Accordingly, the total projected cost for the 70 to 530 net new tonnes of demand is between $690 million and $905 million. This works out to about $1.3 to $12.9 million per tonne of net new demand over the projection period. Rather dear, given that even at a spot price of $340, unhedged producers will get less than $11 million for each tonne produced. The members of the Steering Committee propose that this high cost be shared by all producers, hedgers and non-hedgers alike, pro rata in accordance with their annual production. Little guys get a discount, as do those hitting the wall per "financial distress criteria." The contribution per producer of 100,000 oz. or more starts at $0.30 per oz. produced in 2001, stabilizing at $4.00 per oz. produced in years 2004 through 2006. The vehicle through which the Steering Committee proposes that the GMI accomplish its objectives is a new entity to be nominally grafted onto the World Gold Council, with separate staffing, management and funding. Both members and non-members of the WGC would participate, as the GMI is intended to encompass every producer in the industry. McKinsey is evidently to play a major role in orchestrating the GMI, for an undisclosed remuneration. To underscore the GMI's separation from the World Gold Council and its inclusive, ecumenical nature, the Steering Committee had Bob Buchan, CEO of Kinross, a confirmed non-member, deliver the luncheon peroration. There must be no free riders, he intoned. In Q&A immediately following Bob's address, the delegates were earnestly informed by members of the panel that at root, we all, central banks included, want the same thing, namely a higher gold price. When one encounters an embarrassingly bad idea, it is tempting merely to dismiss it as such and move on to something more challenging. This has been the pattern of much of the commentary on the GMI to date. However, I believe the GMI requires more thorough treatment, for two reasons. First, it has considerable inertia. Substantial resources have been allocated to developing this concept over a full year. Serious people are invested in it; powerful interests will be disserved by its abandonment. It will not be possible to kill this little monster just by blurting out that the Steering Committee has no clothes. Second, there is a coercive, bullying aspect to the demand for 100% support among producers, and the Steering Committee's observation that pressure will be brought to bear on the 30% of the producers who are apparently holding out. Dark mutterings addressed to "free riders" by a group conspicuously plugged into the financial sector must not unchallenged go. So with apologies to those readers who have already reached the obvious conclusion that the GMI is brain dead on arrival, I will briefly recapitulate some of its more glaring deficiencies. In the interest of fairness toward an initiative which was largely developed many months ago, I divide these into those which would have pertained even had the horrific events of September 11 not occurred, and those which pertain in light of the changed world in which we now live. 1. Reasons Why the GMI Was a Bad Idea for Non-Hedgers Even before September 11, 2001. The following objections relate to what the GMI does, not what it should do. The more fundamental objection that the GMI will absorb scarce monetary and intellectual resources to focus on the wrong thing is better and more subtly made by Chris Thompson; see A Beacon for the Oppressed, below. a. The GMI Is Focused Exclusively on a Demand Type Which Is Elastic. The higher the price, the less you sell. The lower the price, the more you sell. Simple, really, except in a real bull market such as that of the 1970's, where I'm reliably informed this conventional wisdom breaks down. The GMI does not appear to have been hatched with a runaway bull market in mind. Nor does it appear to have been designed to provide support for an unconstrained breakout in the spot price of gold. The attraction of a modulating impact on the spot price is obvious in the case of the members of the Steering Committee and other producers who hedge their production; the appeal is far less clear for unhedged producers. b. The GMI is Defensive and Defeatist in Tone. This is not merely a difference in values, those of accountants to whom gold is soybeans versus those of poets to whom gold is permanent, natural money. Rather, it is a hangdog, apologetic approach seemingly calculated to generate just the sort of negative press the GMI in fact received on announcement, with all the usual clichés: "Gold Attempts to Restore Its Luster," etc. We know we make something nobody likes, but we'd like to change that by showing how pretty it can be when dangled as bangles. This negative tone is not insignificant in the context of a campaign to influence how large numbers of people feel about something. c. The GMI's Projected Benefits Are Ludicrously Small. All this for a lousy 70 to 530 net tonnes of new demand? Surely the industry can do better than this; if not, then nothing would be better. e. The GMI's Implementation Machinery Is Preposterous. Drawing inspiration from the late Rube Goldberg, the Steering Committee proposes to create a brand new entity, independently staffed, managed and funded, then stick it inside the World Gold Council, maintaining its separate identity. This conception is so weird, unworkable and interesting that it almost has to be the product of a political struggle which would make for compelling reading. Alas, we don't know why the hedgers have elected to spurn and humiliate a trade association they control. Surely it can't simply be to placate a rabid anti-WGC faction in the producer community. Can it be that the professional staff of the WGC won't buy into this hare-brained scheme? The foregoing considerations would have made adoption of the GMI a bad idea even if murderous fanatics had not launched a devastating attack on Wall Street and the Pentagon on September 11. It is possible, though, that with some horsetrading (we'll sign on to a variant if you cut back on hedging by X, reduce output by Y, etc. ), some sort of workable compromise might have emerged had September 11 not occurred. However, it did occur, and everyone outside the Steering Committee seems to have acknowledged that as a result our world has changed forever. In just the few weeks between September 11 and October 2, when the Steering Committee made its presentation, the United States experienced unprecedented disruptions in its financial markets; domestic airspace was closed for a time to all but military traffic; a newly united U.S. government announced billions of new spending initiatives even as private sector economic activity ground nearly to a halt; the United States commenced a new kind of war, to be waged over an indeterminate timeframe against an indeterminate enemy located in multiple foreign countries; and the Fed orchestrated yet more massive injections of fresh liquidity into the financial markets, while deliberately creating negative real short term interest rates. Notwithstanding the occurrence of these events, and their obvious relevance to an asset traditionally viewed as a safe haven in times of economic and political stress, the Steering Committee, oblivious, pressed on with its agenda. Astonishingly, not one member of the Steering Committee made any mention of the possibility that one or more of these events might have implications for the strategy embodied in, and the economic assumptions underlying, the GMI. 2. Two Painfully Obvious Reasons Why the GMI Is an Even Worse Idea after September 11, 2001.
a. Luxury Goods Consumption Can Reasonably Be Expected to Decline in a Time of Simultaneous War and Recession. Dare I make this assertion without marshaling supporting data? Are not some things so obvious that we need not turn to McKinsey for confirmation? b. When the Market Is Primed to Appreciate Gold's Role as a Safe Haven and Store of Value in Light of Exogenous Events Dramatically Calling into Question the Security of Conventional Financial Assets and Highlighting the Vulnerability of the Global Financial System, It Is Not Smart for a Gold Marketing Initiative to Ignore This. What more can I say? After all the cant and hypocrisy of the GMI blitz, Chris Thompson's presentation, delivered the following day, came as a huge relief. Its content and broader significance are insightfully covered by Tim Wood at the Miningweb in The Thompson Dilemma - gold's new politics. As counterpoint to the GMI it could hardly have been better. It was thoughtful, not glitzy. It was a call for dialogue, not a cramdown. It articulated the real issues facing the industry: a depleting reserve base; a deteriorating financial condition; control over its product exercised by entities hostile to that product but unwilling to cede control; fragmentation; and no consensus on how to take responsibility for its product. And it pointed up the shortcomings of the GMI so deftly and so subtly that sentient members of the audience were left in no doubt where the true leadership of the industry now resides. Diplomatically sidestepping the fact that the GMI is a bad idea, Thompson took an inclusive approach. Yes, jewelry is important, albeit prosperity sensitive and price elastic. (Talk about praising with faint damns.) But the future is in investment demand. This is where potential returns to the producers are greatest; this is where the institutional and infrastructure impediments are most daunting; this is where the resources must be allocated. There is an image problem for gold as investment (an interesting observation; see The Flying Circus, below), and Gold Fields Minerals Services, the orthodox source of industry information, is inadequate and unreliable. Moreover, the existing trade association, the World Gold Council, enhanced as necessary to carry out its new mission, is the right vehicle to vet these issues, forge a consensus, and implement an industry-wide marketing program, not some brand new cost center on wheels. The thrust of Thompson's presentation is so inarguably correct that it seems churlish to take issue with its central diplomatic dodge, that of attempting to incorporate the inertia of the GMI into a broader manifesto for industry deliverance. One is tempted to agree that something is better than nothing, that effort and money expended even on the wrong thing will likely have positive ripple effects on the right thing, that achievement of unity in a time of crisis is worth a tactical compromise or two. One is tempted, but one must stare down the temptation, for two principal reasons. First, the GMI is more than just another bad idea, as painstakingly demonstrated above. Second, unity in this context is a snare and a delusion. It is not the case that at some level all members of the producer community share essentially the same dreams and aspirations. When Randall Oliphant declares that at the end of the day we all want a higher gold price, one fears he is being disingenuous. Randall Oliphant is a talented man, not a moron. Have a look at his hedge book, then run a back of the envelope calculation on what a $150 increase in the gold price would mean to his balance sheet. Papering over a gulf in fundamental interests is dangerous. There is a fundamental, unbridgeable gulf between the big hedgers and the non-hedgers. You either believe in your product or you don't; it doesn't get any more basic than this. The gulf is so great that collaborative action benefiting both sides is not practicable. To paraphrase Woody Allen, the lion may lie down with the sheep, but the sheep won't get much sleep. The non-hedgers must develop their own voice and take control of their own destiny, else risk extinction. Perhaps that voice is a re-energized World Gold Council; it is at least encouraging that the hedgers have denounced it. If not, then a new entity must be created which represents, to take a leaf from The Rev. Jesse Jackson, the gold producers not the gold traducers. As the delegates sipped their chardonnay and nibbled at their poached salmon hollandaise, an unruly mob swirled about in the surrounding cyberspace. Ragged and uncouth, they embodied the great unwashed that all clubs have been formed to exclude, from time immemorial. Rude noises and cries of "wimps!" and "weenies!" filled the air. Who were these barbarians? A confederation of intellectual freebooters, empowered by the internet, intermittently and loosely linked under the "GATA" banner (Gold Anti-Trust Action Committee, www.gata.org) and united in their conviction that the market for the metal under discussion in Denver is rigged by an unholy alliance of governments, central banks and bullion bankers. The Chairman and founder of GATA is Wild Bill Murphy, the patron of Le Metropole Café (www.lemetropolecafe.com), an internet clearinghouse for unconventional investment commentary with gold la spécialité de la maison. Murphy is a former wide receiver for the Boston Patriots and commodities trader with a messianic complex, a flair for promotion and limitless reserves of energy. He also has an unerring propensity to offend nearly everyone, friend and foe alike, with intemperate language and off-the-cuff pronouncements. Unruly, wacky and ill-mannered the GATA mob may be, but dumb they most assuredly are not. (OK, maybe some are. They know who they are.) Indeed, it is becoming increasingly obvious that some of the best thinking on matters affecting the gold sector is now being done outside the cloister in this anarchic tumult. One of the sharpest tacks in this rabble is my friend and business partner Reg Howe, who as everyone knows filed a complaint in Boston federal court against a gaggle of government officials and bullion banks, alleging, inter alia, price fixing of the gold market. The complaint was filed pro se, meaning that Reg is both the plaintiff and the lawyer in the action. GATA has provided some money for the suit and a number of the woolly-heads have pitched in with analyses and advice. Now, in my opinion the evidence adduced in the Howe Lawsuit even at this preliminary stage is overwhelmingly probative that the gold market is rigged as alleged. Indeed, I personally do not believe that it is any longer possible, assuming any degree of familiarity with the complaint and the affidavits, for reasonable men to differ on the basic point. But even if substantial additional evidence were required before price manipulation could be proved in court, this would hardly be a novel condition for an action in which the discovery process, let alone the trial itself, has yet to commence. In any event, one would expect that representatives of an industry which is in desperate financial condition, who produce a fungible product the price of which has been at historic lows for the past several years, and who are gathered in formal and informal congress, might express a passing interest in ascertaining the truth of allegations made in pending legal proceedings that their product has been the subject of an illegal price fixing scheme. The Howe Lawsuit was the skunk at the garden party. No one at the Denver conference, outside a few renegades who recognized each other by their secret handshake, acknowledged its existence or the implications it holds for the industry. 1. The Murphy Factor. Mention Murphy's name to any member of the club and you immediately develop a terminal case of cooties. It is a testament to the awesome power of the internet that a single individual can offend so many. It is also a tribute to the human power of rationalization, that mere association of that individual with serious, formal allegations of market manipulation made by another individual can provide such a handy pretext for ducking the substance of those allegations. It's time to move beyond this shabby pretext and focus on the content, not the form. 2. Mootness. Following September 11, the lawsuit even if correct is irrelevant since there's no way "they" can keep the price suppression going now. Maybe, maybe not. The spot price hasn't exactly run free just yet. "Their" ability to keep it going depends on their remaining firepower, doesn't it? Wouldn't this be useful information to producers? Anyone have a better way of getting at this information than pretrial discovery? Indeed, depending on the answers to some important questions, maybe all producers should go out of business. Or maybe join the GMI, hedge production and push jewelry. 3. Fear of Reprisal. This is legitimate and understandable. The opposition is powerful, ruthless and highly motivated. There are ways to move discreetly, however. Not everyone involved in this quest need don a clown suit and take a position in center ring. 4. Grave Dancing. In the wake of September 11, it is unseemly to be suing the government. Unseemly perhaps, but necessary nonetheless. Price fixing is unjust and illegal. 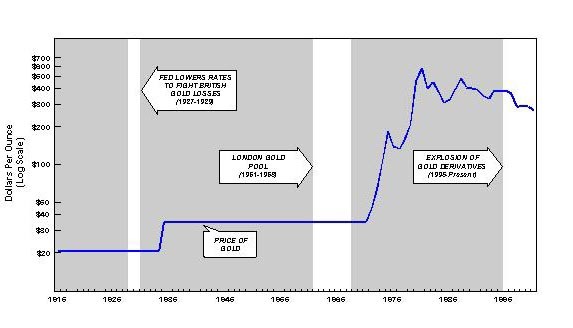 The war on gold was declared and commenced in secret long ago. The events of September 11 do not render that war any more just or legal, or any less of a threat to the very survival of the industry. 5. Free Riding. It was amusing to hear the Steering Committee fret about a free rider problem relative to the GMI. They have no idea. Consider the position of the executives of unhedged producers who ignore the rigging of the market and view gold's defenders with disdain. They won't lift a finger to defend their industry or their shareholders, but they stand to benefit mightily when and if the gold price is liberated through the work of others. 6. Intellectual Vacuity. Some producers simply don't get it. We need not break the proverbial pick on these; time and the market will sort them out. Eventually smart people will replace stupid people if capital ever returns to the sector. None of these factors, alone or in aggregate, comes even close to justifying an ostrich policy regarding the Howe Lawsuit, whichever way it breaks. Following a hearing now scheduled for November 5, Judge Lindsay will decide either to allow all or a portion of the case to proceed, or to grant the defendants' motions to dismiss. Either way, the issues raised by the case will remain. Either way, producers will be put to an election: contribute toward a search for truth and justice, inside or outside the courtroom, or abandon your shareholders and your industry to their fate. Turn in your options on your way out. Overreaching by corporate insiders can sometimes backfire, creating unintended investment opportunities for outsiders with strong stomachs and a speculative bent. Such may be the case with ongoing efforts by Kinross Gold Corporation (NYSE:KGC; TSE:K.TO) to shaft holders of shares of Kinam $3.75 Series B Convertible Preferred Stock (NYSE:KGC.B) (hereinafter, the Converts). You be the judge. The Converts trace their lineage back to the old Amax Gold Inc. Amax issued a total of 1.84 million of them in August 1994 for net proceeds of $88.3 million. More than a few Converts apparently found their way into yield-oriented retail accounts in the United States. In June 1998, Kinross acquired 100% of the Amax common in a reverse subsidiary merger pursuant to which each outstanding share of Amax common was converted into approximately .8 share of Kinross common, and the Converts were made convertible into Kinross common. Kinross thereby became the parent company of Amax Gold, which was subsequently renamed Kinam Gold Inc., and was dropped into an intermediate holding company called Kinross Gold USA Inc. (Kinross USA). When the smoke had cleared, all the Kinam common was held by Kinross through Kinross USA; the Converts remained outstanding and retained their listing on the NYSE; and Kinam remained subject to regulation by the SEC. The entire issue is still outstanding. Kinross reflects the Converts on its year-end 2000 consolidated balance sheet at the original $88.3 million plus dividend arrearages of $3.5 million. The terms of the Converts, which are set forth in Kinams corporate charter, are fairly typical of the genre. Liquidation preference of $50; cumulative dividend of $3.75 per annum, payable in quarterly installments of $.9375 on each February 15, May 15, August 15 and November 15, as and if declared by Kinams board of directors; conversion price (a vestige of a happier time) of approximately $10.31 per share, i.e., each Convert can be swapped for approximately 4.85 shares of Kinross common; 1.4 votes per Convert, all of which vote together with common on all matters except for a few enumerated instances in which a class vote is required. No dividends or other distributions may be made on common shares unless and until all arrearages are current. The Converts are now redeemable by Kinam at any time for cash at a redemption price which is currently $51.50 per share, declining to $50 in August 2004, plus accrued and unpaid dividends. In the event the dividend is skipped for six quarters, whether or not consecutive, the Converts, voting as a class, have the right to appoint two directors to the board. Beginning with the installment due August 15, 2000, the company has skipped all dividend payments. The current arrearage is thus $3.50 per share. Accordingly, if Kinam were to call the Converts prior to August 15, 2001, it would have to pay $55 per share. If it calls them after that date, assuming it skips the August dividend, but before November 15, it will have to pay $55.5625, etc. The preferred share dividend will be re-established when the cash flow at the Kinam level is in excess of that required to deal with Kinams obligations, including debt retirement. Now this is a little ominous, because these gents dont say what debt they mean, and a goodly, nay, a massive, share of Kinams debt is payable to none other than Kinross itself. See discussion below. In any event, the Converts took the news of the skipped dividend badly, and promptly dropped from the mid-20s to single digits in the third quarter of 2000. They now trade between $9-12. It must be noted that life has been unkind to the Kinross common as well; since the acquisition of Amax, in which the common had a transaction value of about $3.65 per share, the collapse of the gold price has resulted in their current trading range under $1.00. Both the Converts and the common have been given official notice of delisting by the NYSE, review pending. The Companys share of production from its operating properties totaled 718,395 ounces of gold equivalent during 2000, and as of December 31, 2000, its share of proven and probable reserves in all its properties totaled approximately 167 million tons of ore reserves with an average grade of 0.028 ounces of gold per ton, or 4.7 million contained ounces of gold. This is not trivial, especially in relation to Kinrosss consolidated share of production for 2000 of 943,798 ounces of gold equivalent (Kinam thus represents about 76%), and Kinrosss attributable proven and probable reserves of 6.92 million ounces of gold as of year-end 2000 (Kinam thus represents about 68%). So whats it worth? Pick a benchmark. Using, for lack of an easier frame of reference, the handy Barrick/Homestake transaction value per reserve ounce of about $110, youd get a gross current value of about $517 million. With some tinkering you could substitute this value for the book PP&E in the balance sheet below to get a quick and dirty mark on Kinams NAV. Now, I doubt there is any investor on the planet more sympathetic than I to the plight of the casualties of the war on gold. Still and all, this company is -- how can I say this delicately -- INSOLVENT. What do I mean by that? Lets turn to Kinross and its creditors for a working definition. (iii) neither Kinross USA nor Fairbanks USA shall have incurred debts, nor shall have intended to incur debts, beyond its respective ability to pay such debts as they mature. Kinam, with its beefy capital deficit and its wimpy capital base, would clearly be snagged by the first two of the three hooks in the foregoing solvency rep. As to the third, who can say? Let us pray for speedy deliverance from the war on gold. So it is no accident that although its wholly owned subsidiary and both its immediate and remote parent companies are Borrowers under the Credit Agreement, Kinam itself is not. Instead, Kinam is just a guarantor and pledgor, on the line for repayment but not obligated to make awkward reps and warranties. That Kinam is insolvent does not apparently concern Kinross or its lenders, nor, indeed, should it. Thats because its insolvency is technical in nature, a matter of nomenclature. It arises out of a decision on the part of Kinross to characterize $294.4 million in capital injections, most of which date back to the original acquisition, as follows: equity, $0.9 million; debt, $293.5 million. So I suspect a good slug, maybe all, of the intercompany debt might well be recharacterized as equity if attempted repayment were to be challenged in an appropriate forum. It wont take the jurisprudential equivalent of a rocket scientist to conclude that any upstream payments in respect of the Kinross debt should properly be viewed as dividends or other distributions on equity, barred until the prior claims of the Converts have been satisfied. The reason given for the move West is one that no long-suffering Gold Bug could fail to support: cost savings. Lots of them. Indeed, just one of the savings noted is a whopper: the Company will pay an annual fee of less than $500 in Nevada compared to an annual fee of $150,000 to which it is currently subject to [sic] in the state of Delaware. Golly wolly. Id say it was high time they got out of Wilmington, since they were clearly getting hosed by the locals. Both Delaware and Nevada allow for stockholders to apply for the appointment of a receiver by a court where the corporation is insolvent. Delaware allows any stockholder, regardless of his or her proportionate stock ownership interest, to apply for such an appointment where the corporation is insolvent. Nevada allows stockholders owning at least ten percent (10%) or more of the outstanding stock entitled to vote to petition for the appointment of a receiver where (i) the corporation is insolvent, (ii) the corporation suspends its ordinary business for want of money to carry on the business, or (iii) if its business has been and is being conducted at a great loss and greatly prejudicial to the interests of its creditors or stockholders. TORONTO, June 12 /PR Newswire/ - Kinross Gold Corporation (TSE-K;NYSE-KGC) and its subsidiary, Kinam Gold Inc. (NYSE-KGC PrB), announced today that an agreement has been reached with the largest holder of the Kinam $3.75 Series B Convertible Preferred Shares to exchange its 800,000 preferred shares (plus rights to accrued but unpaid dividends) for 21.5 million common shares of Kinross. Based on the closing price of Kinross common shares on the New York Stock Exchange (NYSE) on June 12, 2001 of $0.96 per share, this transaction has a value of $20.6 million. As at May 31, 2001 the 800,000 preferred shares were carried at $41.4 million on Kinross consolidated balance sheet. Kinross will use the $20.8 million difference in value associated with this transaction to reduce the carrying value of certain property, plant and equipment on its consolidated balance sheet, resulting in lower future depreciation, depletion and amortization expenses. This transaction is subject to regulatory approvals and Kinross obtaining a receipt from the Ontario Securities Commission for a prospectus qualifying the distribution of the 21.5 million common shares. Upon the closing of this transaction, expected by June 26, 2001, Kinross will own 43.5% of the 1,840,000 Kinam $3.75 Series B Convertible Preferred Shares outstanding. TORONTO, June 18 /PR Newswire/ - Kinross Gold Corporation (TSE-K;NYSE-KGC) and its subsidiary, Kinam Gold Inc. (NYSE-KGC PrB), announced today that two separate agreements have been reached with two holders of the Kinam $3.75 Series B Convertible Preferred Shares to exchange a total of 145,000 preferred shares (plus rights to accrued but unpaid dividends) for 2,686,492 common shares of Kinross. Based on the closing price of Kinross common shares on the New York Stock Exchange (NYSE) on June 18, 2001 of $0.99 per share, these transactions have a combined value of $2.7 million. As at May 31, 2001 the 800,000 preferred shares were carried at $7.5 million on Kinross consolidated balance sheet. Kinross will use the $4.8 million difference in value associated with this transaction to reduce the carrying value of certain property, plant and equipment on its consolidated balance sheet, resulting in lower future depreciation, depletion and amortization expenses. These latest two transactions are subject to regulatory approvals and Kinross obtaining a receipt from the Ontario Securities Commission for a prospectus qualifying the distribution of the 2,686,492 common shares. Upon the closings of these two transactions and the transaction announced on June 12, 2001 Kinross will own 51.4% of the 1,840,000 Kinam $3.75 Series B Convertible Preferred Shares outstanding. You could almost hear the weeping of the widows, and see the lights go out in the little orphans eyes. The specs just gnashed their teeth as the Converts sank from a high print of over $12 down to the $10 level and below, where they languish to this day. On further inquiry, we were informed by management that these tag-along deals arose from telephone calls they received from agitated holders following the first press release. So in other words, a cynic might argue, the first release was the baited hook used to lure in just enough additional Converts to take Kinross over the 50% mark. Happily, this now ensures that Kinross will have full control over the appointment of any new directors in a class vote, effectively depriving the holders of the Converts of their only remedy when Kinross follows through on its plan to continue to skip the dividends. Well. We screamed, we yelled, we made learned remonstrances. (It so happens that several holders of the Converts did not just fall off the turnip truck; my pal Reg Howe also holds a few of these vexing instruments. Gold Bugs everywhere know that Reg is no slouch when it comes to making learned remonstrances.) This is sleazy, we cried; you cant do a sweetheart deal for favored insiders in contravention of the rights of other holders. This is illegal, we yelped; there are rules that say you have to give everybody the same shake. This is dumb, we wailed; the optics are horrible, and who needs the aggravation. All to no avail. The company insists on turning a tin ear to ethics and public relations, and a blind eye to its potential legal predicament. So there you have it. In evaluating this hairball, a rational investor might observe that since Kinross has total control over the situation, it can jam the Converts with impunity and there is no point in waltzing into a meat grinder. A more contrarian, rebellious sort might concede the premise, but differ on the conclusion. Indeed, our take is that despite what Kinross wants, and despite its overwhelming control and all its careful planning, at the end of the day it is going to have to do the right thing. The right thing, it seems to us, will consist at a minimum of an offer to exchange at the same value Franklin got; at a maximum, of a cash redemption at $55 or more per share. The longer this thing drags out, the less happy we will be with equity consideration, and the more inclined we will be to insist on cash. The risks are obviously considerable. In addition to those attaching to most investments in the sector, namely continued price suppression by the enemies of gold, bankruptcy of the issuer, etc., there are some new ones, including the determined opposition of management, the threat posed by imminent delisting from the NYSE (query whether the SEC will be there for us if we get booted off the Exchange), etc. The upside, of course, consists of the excess of whatever the actual payout turns out to be, if anything, over the cost of entry; nothing special here, inasmuch as the upside is capped whereas other equity plays are open ended. The attraction, if any, would be the timetable: since we believe it should be a matter of considerable importance to Kinross that this relatively senior claim on its lifeline be extinguished, we expect resolution sooner rather than later. But that's just us. THE FOREGOING ESSAY IS FOR YOUR INFORMATION AND AMUSEMENT ONLY. NEITHER MR. LANDIS NOR GOLDEN SEXTANT ADVISORS LLC (GOLDEN SEXTANT) IS SOLICITING ANY ACTION BASED UPON IT, NOR IS EITHER MR. LANDIS OR GOLDEN SEXTANT SUGGESTING THAT IT REPRESENTS, UNDER ANY CIRCUMSTANCES, A RECOMMENDATION TO BUY OR SELL ANY SECURITY. THE CONTENT OF THE ESSAY IS DERIVED FROM INFORMATION AND SOURCES BELIEVED TO BE RELIABLE, BUT NEITHER MR. LANDIS NOR GOLDEN SEXTANT MAKES ANY REPRESENTATION THAT IT IS EITHER COMPLETE OR ERROR-FREE, AND IT SHOULD NOT BE RELIED ON AS SUCH. MR. LANDIS AND GOLDEN SEXTANT AND ENTITIES UNDER THEIR RESPECTIVE CONTROL MAY HAVE INVESTMENT POSITIONS, LONG OR SHORT, IN ANY SECURITIES MENTIONED, AND ANY SUCH POSITIONS MAY BE CHANGED AT ANY TIME FOR ANY REASON. 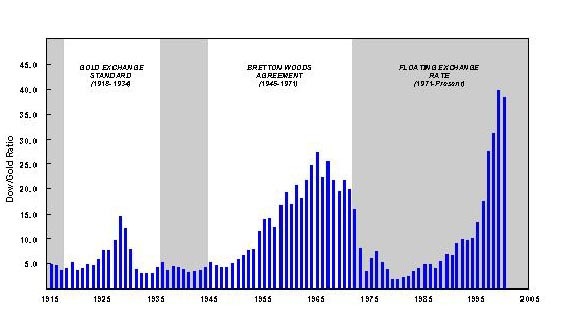 The two charts below portray the Dow/Gold ratio in relation to the international monetary regimes of the past century and the coordinated official interventions in the gold market that marked the beginning of the end for the gold exchange standard and the Bretton Woods system. Great bull markets float not on a sea of easy domestic credit, but an ocean of international liquidity. Gold is best seized at the flood, when Anglo-American governments lead the campaign to denigrate its value in a vain effort to escape its discipline. Note: For a discussion of the Dow/Gold ratio, see Dow/Gold Ratio = 1 at $3000: Don't Laugh!. For a bit of irony, read Fed Chairman Alan Greenspan's account of the Fed's decision in 1927 to lower interest rates in his 1966 essay "Gold and Economic Freedom" (reprinted in A. Rand, Capitalism: The Unknown Ideal), and quoted in part in Collision Course: Gold and Greenspan.